Quang Nam (VNA) – Dutch experts suggested constructing artificial islands off Hoi An coast in the central province of Quang Nam to shield it from strong waves, helping reduce coastal erosion and creating new tourist attractions in the locality. They recommended the solutions after inspecting Cua Dai beach, which has been hard hit by serious erosion for years, with Minister of Natural Resources and Environment Tran Hong Ha, Chairman of the provincial People’s Committee Dinh Van Thu, Dutch Minister of Infrastructure and Water Management Cora Van Nieuwenhuizen on April 10. The experts said that the construction should be made based on sustainable preservation of biodiversity in the area. Minister Tran Hong Ha spoke highly of the recommendation, describing it as an audacious initiative to prevent coastal erosion in the locality. As the eroded site is located inside the Cham Islands Global Biosphere Reserve, Cham Islands Marine Protected Area and Hoi An ancient town - a UNESCO-recognised world heritage site, scientists and experts should stay prudent while carrying research and giving evaluation on environmental impacts to outline the best solutions to settle coastal erosion in Hoi An in a comprehensive and sustainable manner. 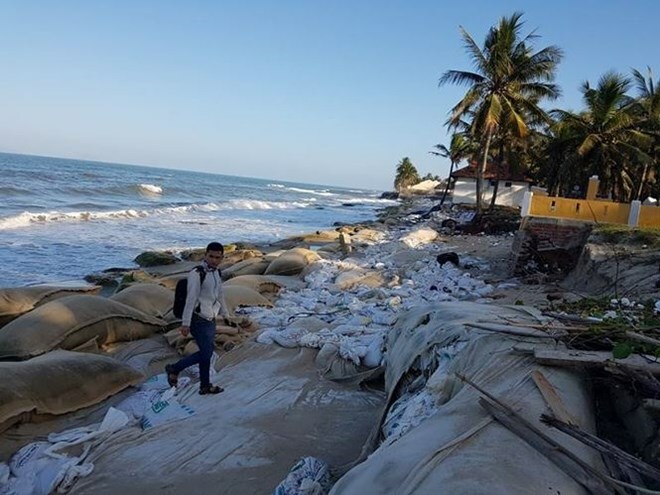 Cora Van Nieuwenhuizen, for her part, affirmed that the Dutch Government always pays attention to the adverse effects of climate change on Vietnam’s beaches. She asked the Dutch experts to join hands with competent ministries in Vietnam and Quang Nam province to give out optimal measures to save Hoi An beach, one of the most stunning beaches in the world. Cua Dai beach, which is 5km from Hoi An's old quarter, is a favourite location for tourists visiting the UNESCO-recognised ancient city. It is 7.6km long and was 3km away from the shore 40 years ago. However, in recent years, erosion has eaten into the land at an alarming level.